Wondering if you’re using LinkedIn to your best advantage in your executive job search? My FREE popular ebook will help you leverage this most important social network and accelerate your executive job search. Build Your Personal Brand and Land a New Job Faster! Savvy executive job seekers are already there, leveraging all that the site has to offer – networking, blogging, researching, building brand evangelism . . . and staying top-of-mind with people who can lead them to job opportunities. Having a strong LinkedIn profile and presence indicates that you’re social media savvy and up-to-date with the digital age. NOT having a strong LinkedIn profile can actually be detrimental to your executive job search. An understanding of how to use LinkedIn – and a solid strategy – is needed for anyone who wants to optimize the value of this essential professional social networking tool. If you’re not actively job-hunting, you don’t think any of this matters to you right now. Well, it does matter . . . very much. If you’re not on LinkedIn − with the best possible profile content and proactive usage − you may be invisible to the very people who can help you meet your executive job search and career goals. Whether you’re already on LinkedIn, an occasional user, or about to dive in for the first time, this ebook will help you improve your personal brand and your visibility to your target audience. ⇒ Why LinkedIn is an executive job search must. For one thing, it’s the #1 place employers and executive recruiters source candidates like you. ⇒ How to write the right kind of content for your LinkedIn profile. You’ll start by defining your personal brand, and then write compelling content that will resonate with your target employers. ⇒ How to build out and brand your LinkedIn profile using these sections − Professional Headline, Summary, Experience, Education, Skills & Endorsements, Recommendations. ⇒ Why keywords are important and how to incorporate them into your LinkedIn profile. ⇒ Understand why LinkedIn Groups are important, and how to choose the right ones and use them wisely. ⇒ Position the content to your best advantage “above the fold”, or high on the web page, where humans and search engines pay the most attention. ⇒ Leverage Search Engine Optimization (SEO) to boost your LinkedIn profile views. The more views you get, the more potential leads you may receive. ⇒ Use LinkedIn to research your industry and target employers. When you know how you can help them with their current pressing needs, you’ll have a better handle on how to position yourself to attract them with your LinkedIn profile content. ⇒ Keep your job search undercover, as you use LinkedIn. Although there’s no guarantee that you can keep your search entirely under wraps, there are ways you can minimize that risk. It won’t take long to read the ebook, but you’ll find yourself going back to it again and again, as you build out your LinkedIn profile, design a manageable strategy to use LinkedIn, and network your way into a new executive job. How do you get your hands on my LinkedIn ebook? 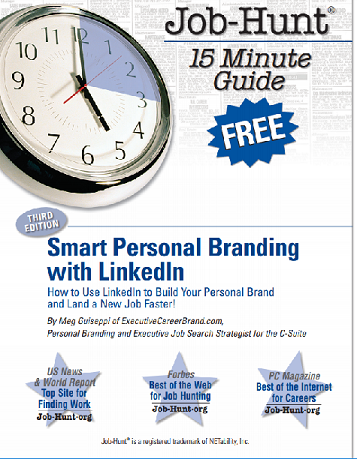 Sign up here to get my FREE EBOOK, Smart Personal Branding with LinkedIn, and never miss another one of my timely and valuable articles on navigating today’s executive job search (personal branding, LinkedIn, resume writing, social media, online presence and so much more).